But what they say is extremely unlikely to have any impact on what the commissioners vote to do at the end of the hearing. The county already has agreed to provide these waivers and variances as part of a settlement of a lawsuit filed by a neighbor of the Knowlton property, and the advertised hearing is merely a formality. The settlement, County Attorney Daniel Haygood told me in a telephone conversation today, was made on the presumption the county would grant the variances requested. Haygood said property owners Gary and Linda Carroll filed suit against the county back in the 1990s when the county built what is now the Oconee Connector, which runs from the intersection of Daniells Bridge Road and Mars Hill Road to SR 316. The Carrolls said the county “unfairly denied” them access to the Oconee Connector, Haygood said. The Carroll property–actually two tracts totaling 5.1 acres–is tucked inside the Knowlton property. 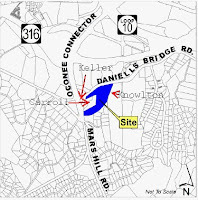 Prior to the construction of the Oconee Connector, they had access to Daniells Bridge Road before it intersected with Mars Hill Road. But that section of Daniells Bridge Road was closed to make the new, square intersection of Daniells Bridge Road with the Connector. The land on which the roadway had existed will be given to Paul A. Keller, who owns the half-acre triangle of land between the old roadway and the new intersection. Under the agreement, the expanded Keller land, the Carroll property, and the Knowlton property all will share what Haygood called a “stub” that will give them access to the Oconee Connector. The Knowlton Estate has agreed to provide land for that “stub” only on condition that the variances are granted, Haygood said. The estate is asking that a minimum 50-foot wide undisturbed buffer to a water source be reduced to 25 feet and that a required setback from the property line of 25 feet for all impervious surfaces, septic tanks and drainfields be eliminated. The estate also wants to reduce the required 50 foot buffer to adjoining property to a width of 25 feet. The buffers are required in the county’s Unified Development Code, which sets standards for construction in the county. Haygood told me he generally does not worry too much about the precedent BOC decisions set in zoning matters, but he particularly isn’t worried in this case. “This is so unique that, even if precedent were important, it wouldn’t matter much in this case,” he said. The Knowlton property actually has considerable frontage on Daniells Bridge Road, and Haygood said the attorneys for the Knowlton Estate have said they doubted they would use the Oconee Connector “stub.” They want it as a safeguard, he said. The 14.3 acre tract sits across Daniells Bridge Road from the QuikTrip gas station, the entrance to the county fire station, and the SpringHill Suites hotel, making it prime space for development in a stronger economy. The land already is zoned for business use. The property on which QuikTrip sits was part of the tract Keller still owns. It was purchased from Keller in 2009. One home is built on the two pieces of property owned by Carroll and is tucked back in among trees, barely visible from the busy intersection. The two Carroll properties have an Epps Bridge Parkway address in the county tax records. Historically, Epps Bridge Road–now called Old Epps Bridge Road–traveled across what is now SR Loop 10 and intersected with Daniells Bridge road just west of the big curve. Epps Bridge Road then continued to Mars Hill Road in front of the Carroll property. The section of Epps Bridge Road west of the old intersection was made into an extension of Daniells Bridge Road when SR 316 and Loop 10 were built and Daniells Bridge Road was truncated at SR 316 and Epps Bridge Road was ended east of SR Loop 10. The variance request is scheduled to come early on tomorrow night’s BOC agenda. Most of the items the commissioners will be dealing with are on the consent agenda, meaning they will be voted on as a block unless a commissioner asks that the item be pulled for discussion.